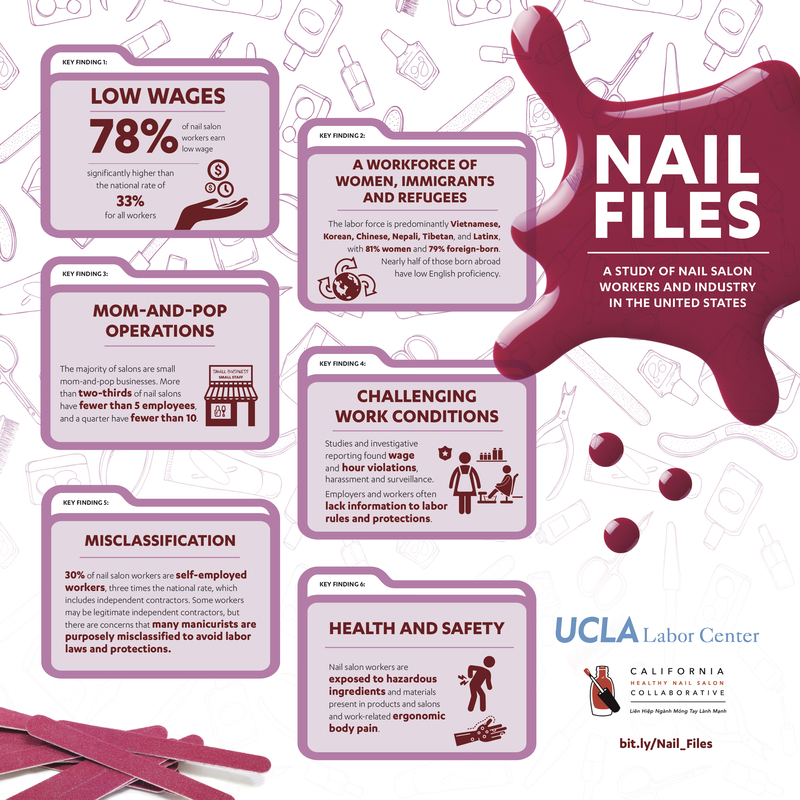 Key issues, trends, and areas of oversight in the multibillion dollar nail salon industry are highlighted in Nail Files: A Study of Nail Salon Workers and Industry in the United States. This report is the first to examine the nail salon industry nationally with a focus on labor conditions. 78% of nail salon employees are low-wage workers. This is more than double the national rate of 33% for all industries. Nail salon workers experience challenging work conditions and labor enforcement issues. Misclassification as independent contractors is also a key concern. Nail salons are primarily owned and staffed by immigrants and refugees. The majority of salons are small mom-and-pop businesses with 68% having fewer than 5 employees. The labor force is predominantly Vietnamese, Korean, Chinese, Nepali, Tibetan, and Latinx, with 81% women and 79% foreign-born. Key findings infographic. Click image to view in full size and download. The nail salon industry is expected to grow at almost twice the rate of other U.S. industries in the next decade, and report authors make recommendations for key stakeholders: ensure quality jobs and labor protections for nail salon workers; guarantee workplace protections and their enforcement; support high-road businesses and good employers; and assure health and safety of nail salon workers. This report was produced in partnership with the California Healthy Nail Salon Collaborative.